I’m almost a week late for Father’s Day (I was busy lying on the sofa watching golf that day), but I came across a website recently that was looking for examples of good dads in literature. Bad dads abound, it seems, and the blog author was having a hard time coming up with role models from the world of fiction. After some thought, I came up with the following ten in no particular order. What do you think? Any others come to mind? Technically, Mr. Pegotty is an adoptive uncle, not a dad, but he behaves like an ideal father. Caspar Ten Boom isn’t a fictional character, of course, but I’ve always found his example quite inspiring and I consider The Hiding Place a work of literature. I just noticed that half of the men on this list are single dads: Atticus Finch, Jeremiah Land, Geppetto, Mr. Pegotty, and Jean Valjean. Thomas Schell is dead at the start of the book, and Matthew Cuthbert is unmarried, raising Anne with his sister. Mr. March is away serving in the war for most of the book. Not sure what that all means, but only two of them are model husbands as well as fathers. It’s just rare to find a regular nuclear family that is healthy and solid in the realm of literature. I’m not suggesting some kind of conspiracy here. Happy families can be boring and don’t typically make for interesting stories. Your turn. Who’ve I missed? I just had to read this post when I saw the headline to be sure Atticus Finch was on the list. I was most gratified to see him at the top! Excellent list! One of my favorite dads in literature is Master Nathaniel Chanticleer in LUD-IN-THE-MIST, by Hope Mirrlees. Great to hear from you, Fred! Not familiar with that book, but I’ll consider that a recommendation. Going back to Les Mis or even Shakespeare, for that matter, The BIBLE!, shows us the “nuclear family” is something the producers of Leave It to Beaver came up with as some sort of ideal we all then feel we fall short of. There weren’t even average, nuclear families during the nuclear family age or we would have never ended up with the 60’s/70’s! I am glad to be seeing a trend, if ever so slightly, towards dads. Recent movies and such have started to show men as good dads instead of bumbling, absent, nimrods. I am not well read in modern literature to know if it is trending there as well. Thanks for the list! Good books to read, good movies to watch. Good thoughts, Cheryl. Thanks. Glad you liked the list. 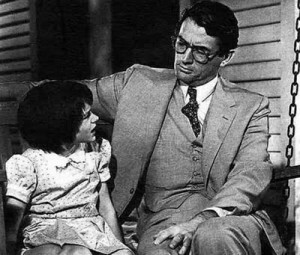 I’m not sure we’re really seeing a trend towards dads, but there are some examples of loving fathers in recent literature, for sure. Rabbi Malter, the father of Reuven in The Chosen, by Chaim Potok. (Sorry, I tried to italicize the book title, but it didn’t work!) That book also shows a bad example of fathering in Reuven’s friend Daniel. The contrast between how those two boys were raised is astounding.